Judi has been involved with crafts and working with her hands her whole life. She takes care of most of the day-to-day responsibilities of the store, including purchasing and merchandising, as well as making many of the handmade goods in the store, including soap, potpourri, candles, and dockside village scenes made from driftwood. Judi's son Ed is one of the store's featured artists, as well as the computer, and marketing person. Dogs regularly drag their owners into the shop for regular visits when the door is open. (Ed gives good treats). 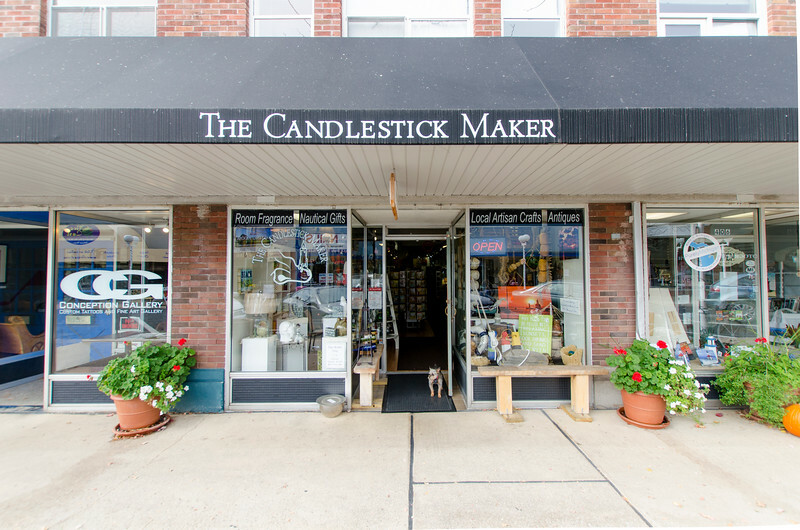 The Candlestick Maker opened on April 6th, 2011 at 408 State St., downtown St. Joe. The shop actually relocated from a smaller booth at the American Countryside Farmers Market in Elkhart, IN. The business is a dream of Judi Benninghoff, who retired a few years ago after a 42 year career with Alpha Baking Company of LaPorte, IN. She has taken the leap to open this larger store in St. Joseph and has comitted all of her retirement nestegg with the belief that her store will draw a faithful local following, as well as seasonal shoppers visiting town. Stop in and say hi to Judi and her little dog, Lolli. You can reach us by phone at (269) 932-4211. Or, click the button below to send us an email.